After a long summer of flag waving and royal baby madness, it was only too soon that the patriots needed a new distraction. Lo and behold, it came in the form of an angry tirade directed at immigrants once again. 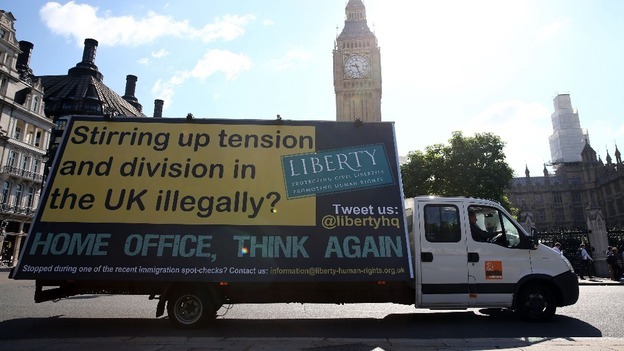 Large billboards and signposts carrying the warning “Go home or face arrest” are being driven around London on the back of advertising vans in a new Home Office bid to reduce “illegal immigration”. Except on the face of it, it is selectively targeting areas where non-white folk may be residing. The advertising vans have been initially deployed to six London boroughs including Ealing, Barnet, Barking & Dagenham, Brent, Redbridge and Hounslow. It comes as no surprise that five of the six areas are in the top 10 ethnically Asian boroughs. According to the 2011 Census from the Office for National Statistics, more than 116,000 ethnically Asian people live in Redbridge, the second highest number out of all London boroughs, closely followed by Brent with 105,986. So is it by coincidence that these areas are being specifically targeted? We are making it more difficult for people to live and work in the UK illegally. But there is an alternative to being led away in handcuffs. Help and advice can be provided to those who cooperate and return home voluntarily. And in a typical British fashion, giving a sharp nudge of the elbow, it seems the Home Office is quietly ushering out non-white folk by the back door. The UK government appears to be ‘helping’ immigrants by offering a phone number, potentially giving free flights and other travel assistance, but it is a choice of two evils: ‘Go home or face arrest’. The initiative has received criticism from local campaign group Southall Black Sisters as well as human rights organisation Liberty. Meena Patel from SBS warned that the government is “turning the clock back to the 1970s”. She also said the UK’s hunt for illegal immigrants was “akin to Nazi Germany”. “They may deny it, but that’s what it looks like,” she added. 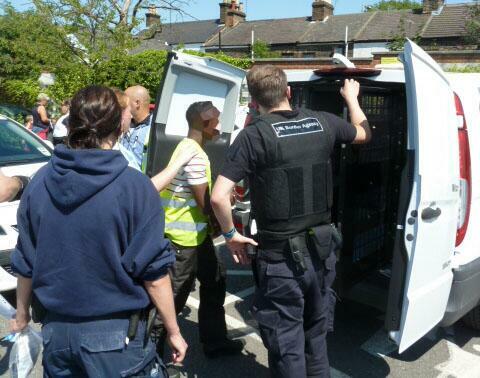 The caption for this picture was, ‘A suspected visa overstayer arrested at a Swansea nail bar’. The Home Office posted images of ‘immigrant arrests’ after announcing the scheme, but was widely criticised after the photos appeared to show only ethnic minorities being targeted. Why are they focusing on people of colour, I am sure there are illegal immigrants from all countries? Why are they focusing on that? That is where racial profiling is coming in. A statement from Liberty said the Home Office’s messaging had “racist connotations – mirroring National Front slogans from the 1970s”. It’s worrying that even right-wing Ukip party leader Nigel Farage agreed that the posters were “nasty” only because it was “driving away support” from the party. And to contribute to the general tone of Daily Mail-style anti-immigrant sentiment, a senior Ukip politician has been caught on camera this week saying Britain should not send aid to “bongo bongo land”, claiming the recipients lavishly spend the money on luxuries. Godfrey Bloom, a Ukip MEP, was filmed at a meeting of supporters in the West Midlands saying those who received aid spent the money on “Ray-Ban sunglasses, apartments in Paris, Ferraris and all the rest of it”. Adding insult to injury, he defended his comment saying: “If I’ve offended anybody in Bongo Bongo land, I will write to their ambassador at the Court of St James.” He later ‘apologised’ adding that he did not want to “upset” his party boss or party chairman hence he “shan’t use it again”, before walking out of a Channel 4 interview. But it raises a rather big and uncomfortable question for ethnic minorities – how is this going to end? Are non-white British people being squeezed out from the middle? I’m going to tell people what I believe. And I believe that diversity is good for Britain. But it’s got to be made to work for all and not just for some. And that means everybody taking responsibility, everybody playing their part and contributing to the country. That is what One Nation is all about, and that’s the Britain I want to build. There was thought that ethnic minorities may push their vote towards Labour at the next election, especially after four years of being in the firing line for all of Britain’s troubles. But Labour’s popularity has been waning as shadow health minister Diane Abbott said following the speech. We are in the middle of a recession, or as near as damn it. In a recession you always see a rise in racism and anti-immigrant feeling – you had it in Germany in the 1930s. We have to be very careful about our language because when people are frightened about their future, they want to blame outsiders, they want to blame the other. And this is the crux of the debate. The immigration polemic has been racialised by politicians no matter how much they try to distance themselves from it. By targeting ethnically specific areas, overtly arresting non-white people and referring to resources being taken away to ‘bongo bongo land’ suggests nothing other than let’s get rid of those ‘benefit-scrounging’ immigrants or in other words non-Caucasian ethnic minorities. Posted by suswatibasu on August 7, 2013 in politics and tagged Discrimination, Racism, Suswati Basu, UK. Suswati Basu is a writer, journalist, producer and feminist activist residing in London. She has written for the Guardian, Huffington Post and the F-Word blogs, and has worked for various media outlets such as the BBC, Channel 4 and for ITV News/ITN. She currently works as a senior intelligence expert. Will South Africa survive without its symbol of hope Mandela? Is Britain’s attitude towards its extradition detainees fundamentally racist? Suswati Basu is a 25 year old writer, journalist and feminist activist residing in London. She has written for the Guardian, Huffington Post and the F-Word blogs, and has worked for various media outlets such as the BBC, Channel 4 and currently works for ITV News, but all views are her own. Winner of the Emma Humphries Memorial Prize in 2007, also shortlisted for the Guardian Mary Stott Prize in the same year, and more recently longlisted for the Guardian International Development Journalism Award. Has worked in China, India and the UK and currently writes on a freelance basis. All views are personal and not reflective of the employer.